We know that Cisco Catalyst 4500E has two main Power-Supply Options: AC and DC. 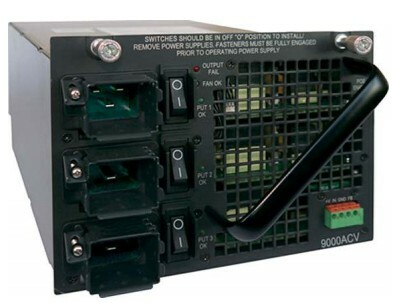 9000W (data and PoE) Power Supply is the AC power-supply option. And Cisco Catalyst 4500 Power Supplies support three modes of operation: Redundant 1 + 1 Mode, Redundant N + 1 Mode, Combined Mode. In all the modes the two power supplies need to be of equal wattage and type (AC/DC). Like the 6000W ACV, and 4200W ACV power supplies, the 9000W ACV can also be used in the N + 1 mode of operation in addition to the 1 + 1 and the combined mode of operation. It offers 5 + 1, whereas the 6000W ACV and 4200W ACV power supplies offer 3 + 1 redundancy. Note: The Cisco Catalyst 4500E platform is the most widely deployed modular access platform and has been the industry leader for Power over Ethernet (PoE) technologies. The 9000W power supply now makes the Cisco Catalyst 4500E platform the most scalable modular platform in the industry in terms of its inline power delivery capabilities. The 9000W power supply can support up to 384 ports of PoE, 232 ports of PoEP, and 116 ports of UPoE simultaneously in a fully redundant (1 + 1) configuration. • The new 9000W power supply continues to deliver on the strong investment protection offered by the Cisco Catalyst 4500E platform, a key value proposition that differentiates the platform. This power supply is backward-compatible with all E-Series chassis, supervisor engines, line cards, and most older line cards as well. • The new power supply measures the input and output power consumption of the system, enabling customers to optimally provision the right number of circuits in the wiring closet and accurately size the backup power (uninterruptible power supply [UPS]), thereby reducing infrastructure costs. • It is equipped with “remote relay” functions that enable you to remotely shut down or power cycle a Cisco Catalyst 4500E Series Switch for maintenance when there is no access to the console or command-line interface (CLI) of the switch, thereby reducing maintenance costs. Note:This power supply works with Cisco IOS XE Software Release 3.4.0SG and 15.1(2)SG or later. Note: The 9000W AC power supply also supports a true output power consumption monitoring capability.